Well, I’ve been meaning to show some of my new toys, but I kept putting it off due to a combination of busy-ness and laziness. Therefore, I’m making it up to you guys by shoving three of them in your faces, in the same day. There’s a common theme here, which you can already guess by the title. Jaguar XJ220 by Top Marques - no more needs to be said. Everything about this car screams exotic. It’s low, it’s long, and it’s wide. From a bird’s eye view, it dwarfs other cars nearby. I’m gonna assume Top Marques got the scale correct, and they better have, because their stuff isn’t cheap. These guys come from the same company as BBR, so go figure. The question is “Does the level of detail live up to the price?” I’m happy to report that yes, for the most part it does. Engine detail hasn’t been compromised despite this being a sealed piece. The grille inserts are a thing of beauty, but they come at a cost because they’re also extremely fragile. The XJ220 is a rather straightforward design, so there really isn’t much opportunity for Top Marques to flex their detailing skills. Nonetheless, they’ve got all the important areas down. One thing I’d like to see is carpeting, as the interior is pretty bare. Fit and finish could be better but hey, it’s a Jag. And in true Jag fashion, I’ve already broken a wiper in my month-and-a-half of ownership. 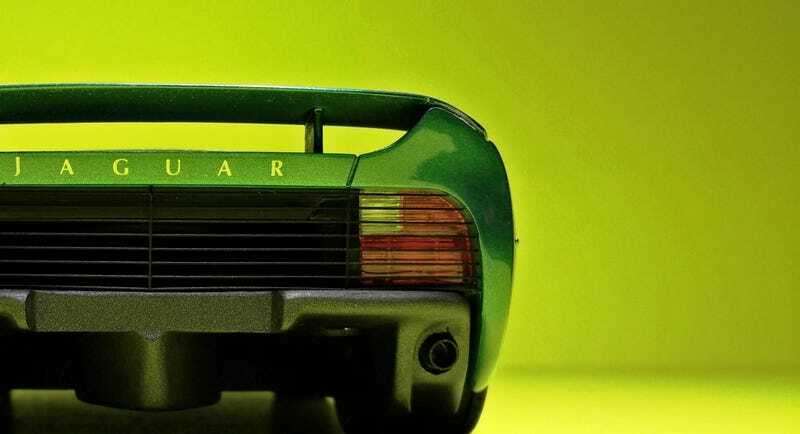 Whether this model is for you or not, the significance of this release is that collectors can now have a XJ220 that isn’t a Maisto. 20+ years later, we’ve finally made it.